Welcome to our January 2018 issue of GL's Newsletter providing information and insight into our Products, Platforms, Trends and News that provides bird’s eve-view of entire gamut of GL’s Telecom Test and Measurement Solutions. 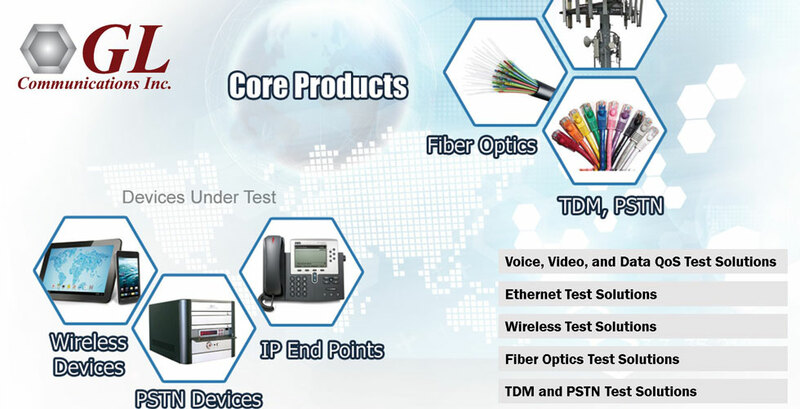 GL is a leading test and measurement equipment manufacturer of WIRELESS, IP, FIBER OPTICS, and TDM products. Unlike conventional test equipment, our test platforms provide unprecedented visualization, capture, storage, and other features without sacrificing portability, convenience, or cost-effectiveness. We also offer consulting services for testing and analysis, system design of Wireless, IP, Satellite, Fibre-optic, Digital, and Microwave networks. GL's Quality of Service (QoS) Test Suite, is a true end-to-end test solution that complements all of GL's products. Connections can be made to any wireless or wired phones and devices to perform automated call control, send and receive voice, video, and data, perform real-time signal measurements and GPS mapping. These supported interfaces allow testing of a variety of networks including Wireless (3G, 4G, VoLTE, WiFi), Analog PSTN, VoIP (including ATA), and Mobile Radios (using PTT). Using ITU-standard algorithms (PAMS, PSQM, and PESQ), GL's VQT provides a widely accepted solution for assessing voice quality in the telecom industry. VQT across multiple networks (T1, E1, T3, E3, OC-3, OC-12, VoIP, Wireless, and Landline) are all available. Automated data testing on wireless or wired networks include TCP, UDP, VoIP, Route, HTTP, FTP, DNS, SMS, Email, SIMInfo, Phone Info, and UEInfo. Automated video conference testing provides Audio and Video MOS QoS results along with several network performance metrics. GL’s VoIP and IP products generate / analyze thousands of calls and traffic simultaneously with traffic types such as frames, packets, voice files, digits, video, tones, noise, and fax. Almost all codecs are supported including AMR WB, EVS, GSM, iSAC, and many more. Additional features include visual analysis, real-time listening, and recording. The product line also includes multi-functional Ethernet / IP Testers that are used to test routers, switches, VoIP handsets, VoIP PBXs, set-top boxes, and VoD servers. The test tools generate traffic at line rates and checks frame transport, measures throughput parameters, including delay, errors and other impairments. GL’s WAN Simulators support testing WAN links by simulating the real-time IP and Carrier Ethernet network dynamics by means of hardware controlled packet delay, loss, jitter, errors, bandwidth limitations, congestion, and duplication. Related Products: MAPS™ VoIP (SIP, RTP, ED137, MGCP, MEGACO, SIGTRAN), PacketExpert™ (1G, 10G, and Multi-Port), IPNetSim™ 1G/10G, VQuad™ Probe HD, WebViewer™, PacketScan™ (available in Basic, HD Versions), NetSurveyorWeb™ , PacketCheck™, PacketShark™, GLInsight™. GL has broadest range of test and simulation tools for wireless devices and network. The test suite can be used to simulate all or specific elements within wireless networks infrastructure using simple ready-to-use test bed setups. It allows for functional testing, performance testing, and conformance testing compliant with ITU-T and 3GPP standards. Product capabilities range all traffic types (Voice, Digits, Tones, Fax, and HTTP). In-lab and field testing solutions, unlimited ability to edit wireless communication protocol messages, control call scenarios are the few striking features that customers often seek. With GL’s Wireless Network Lab, you can simply plug the hardware in-your-lab and test infrastructure for various functions such as call between two UEs in same network or different networks, CS fall-back and SMS while roaming, location services, and many more. Related Products: Complete 4G/3G Wireless Lab, MAPS™ Wireless (LTE, IMS, UMTS, GPRS, GSM, BICC, CAP, MAP, INAP), VQuad™ Probe HD, Video Quality Testing, Data Quality Testing, Drive Testing, WebViewer™, PacketScan™ (available in Basic, HD Versions), TRAU Protocol Analyzer, NetSurveyorWeb™. GL’s SONET/SDH Network Test Solutions include the products that support wire-speed recording and playback of unchannelized and channelized traffic over OC-12/STM-4, and OC-3/STM-1 lines. The test tools support capturing, monitoring, emulation, and protocol analysis over SONET-SDH links. In channelized mode, within an OC-3/STM-1, all 84 T1s or all 63 E1s can be identified and processed in transmit and receive modes. In an channelized OC-12/STM-4, all 336 T1s or all 252 E1s can be identified and processed in transmit and receive modes. The hardware can also be easily configured / programmed for delaying of ATM Cells or PPP packets. The product line also includes multi-functional Ethernet / IP Testers that can perform independent layer-wise (VLAN, MPLS, IP, UDP) testing at wire speed on 1 Gbps and 10 Gbps optical interfaces. GL’s WAN Simulators support testing optical WAN links by simulating the real-time IP and Carrier Ethernet network dynamics by means of hardware controlled packet delay, loss, jitter, errors, bandwidth limitations, congestion, and duplication. Related Products: Unchannelized LightSpeed1000™, Channelized LightSpeed1000™, ATM Protocol Analyser, PoS Protocol Analyzer, UMTS Protocol Analyser, IPNetSim™. GL’s TDM Analysis & Emulation line of products includes T1, E1, T3, E3, Datacom, Analogue 2-wire, 4-wire, external portable pods, and complete system solutions. Capabilities include voiceband traffic analysis and emulation across all traffic types (voice, digits, tones, fax, modem), all protocols (ISDN, SS7, GR-303, Frame Relay, HDLC, V5.X, ATM, GSM, GPRS, LTE, etc. ), and with capacities up to thousands of channels. Tap for non-intrusive monitoring, capture and replay, or perform load testing by simulating high volumes of callers. Our newest products provide astonishing capacity and capture capability up to and including gigabit speeds. There are several customized products under this category designed to cater to industry-specific requirements. Some example of this are, a complete 911 test solution to validate and test CAMA-type 911 networks, and an echo mitigation system designed to address the audio delays issues resulting from the different backhaul technologies and remote sites. GL Communications provide products in PSTN network platform that test a Central Office (CO), PBX, ATAs, Gateway or other telecommunications equipment which provide local loop interfaces. The products have capabilities such as call monitoring; call recording and analysis. GL’s Traffic Classifier provides non-intrusive, real-time monitoring and classification of 16 different traffic types including silence, voice, a variety of data modulations, fax modulations, DTMF digits, and call progress signals traffic. GL’s Echo Canceller testing solutions provide the broadest range of simulation and analysis, including line and acoustic echo. GL’s compliance testing per G.168, G.167, and P.340 procedures across Wireless, IP, and TDM networks is widely accepted in the industry. GL’s QoS Test solutions help assessing impairments to voice quality such as poor mobile phone quality, voice compression and decompression algorithms, delay, loss and gain in speech levels, noise, acoustic and landline echo, and other distortions are easily assessed and accurately measured. Video Quality Testing Solutions offer full automation. As public safety networks evolve, test and measurement is key.